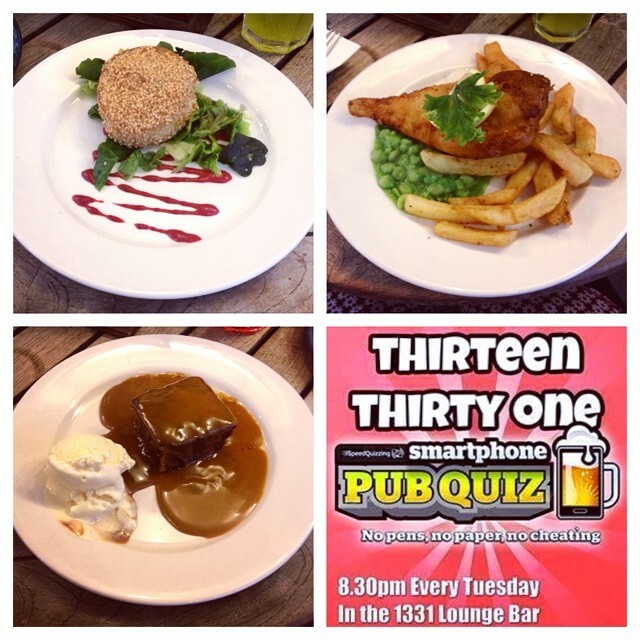 1331 York Bar & Restaurant: Speed Quiz! 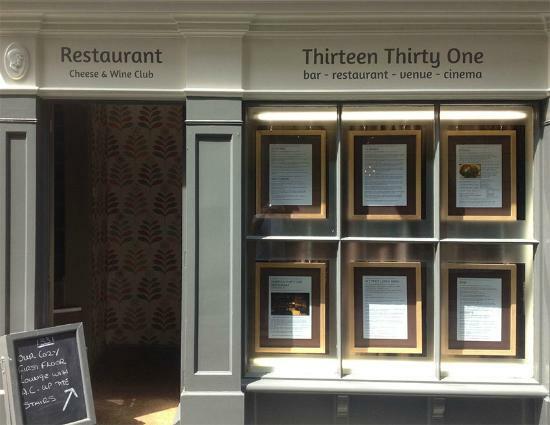 1331 is a great little place in the ‘Latin quarter’ of York. It’s a bar, restaurant and cinema with a friendly, relaxed vibe. We decided to try their speed quiz last night after a quick bite to eat outside. I have to admit I’m not a fan of pub quizzes. I never know the answers, it annoys me when people cheat and, to be honest, I just get bored with the whole drawn out 3 hour long process! The 1331 speed quiz is something a little different though – it uses smart phones and tablets as answering devices/buzzers and the emphasis is on fun and speed. But first…..dinner. The quick bite soon tuned into a full 3 course meal after seeing the deal they had on their set menu! They had a set lunch menu that ran until 7pm and we got three courses for £12.95 – great value! It was nice too. On the set menu starters included goats cheese, minted pea soup and tomato and mozzarella salad, traditional mains such as sausages with mash and fish and chips were also on offer followed by sticky toffee pudding or crème brûlée with shortbread. They also have a wider food menu available including sharing platters available in the bar area or a full menu upstairs in their restaurant. The food really was nice. We had to wait a little while for it to arrive and service at the bar was slow as I think they were a little short staffed. Saying that, 1331 has a nice relaxing atmosphere – perfectly suited to a Summer night in York – so you don’t mind too much taking it at a leisurely pace. Head there on a Friday and Saturday night and the place is much busier – packed full of people looking for a good night out. Drinks are pretty good value too. They had a few cocktails on a 241 offer and a couple of real ales behind the bar. The staff were friendly and happy to advise or answer questions. We just about finished our food in time and headed upstairs to the packed bar for the Speed Quiz. It’s a clever concept and a lot faster paced than a normal pub quiz. Each team needs a smartphone or tablet between them. You connect to their Wi-Fi, enter a team name, choose a theme tune and you’re set. Our theme tune of Earth, Wind and Fire played each time we managed to answer the quickest and was met with celebrations (by us) each time! The maximum team size is 8 and there’s a pound entry fee for each person. Prizes include food and drink vouchers to be used at 1331 – there’s a 1st, 2nd and 3rd price so you’re in with a good chance of winning something. The questions were broad and covered a whole range of topics – general knowledge, maths, food, sports (but thankfully not too many of these! ), a music round and a number of picture questions. The pictures appear straight on your device so there’s none of this all passing round a blurry black and white, tiny image trying to make out who or what it is! The pace is fast and there’s regular breaks for bar visits. It’s a lot more inclusive than other pub quiz’s with teams’ theme tunes being played for the fastest answer and the scores read out througout the night which helps to keep the tension up. The quizmaster was clear and friendly and all the technology seemed to work smoothly! 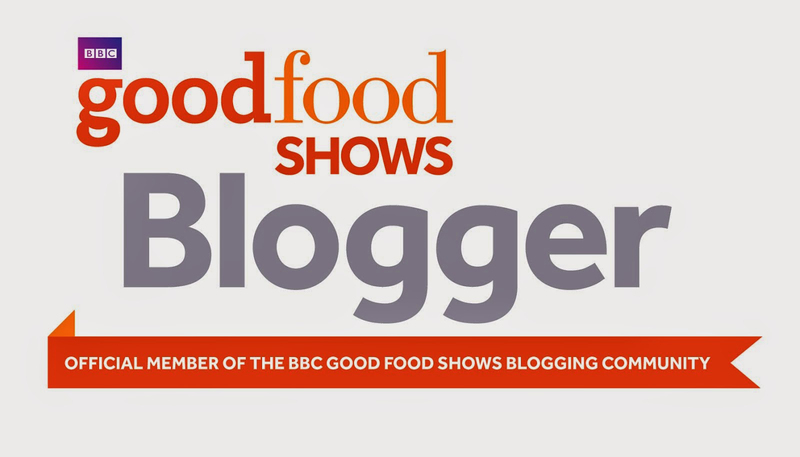 I’d definitely go back to this quiz again….especially after we came first! (no thanks to me I might add). If you want to find out more about 1331 York head over to the 1331 website.